With an online master’s in human resources, you will work behind the scenes to ensure that businesses and organizations cater to the diverse needs of their employees, while also maximizing employee potential. The Bureau of Labor Statistics (BLS) projects that the need for human resource specialists will grow at the same rate as the national average for all occupations. However, HR positions that typically require candidates to possess an online master's in human resources—such as management positions—are expected to grow faster. The financial benefits attached to these positions bodes well for managers. Whereas HR specialists offer competitive median salaries—more than $20,000 higher per year than the median national salary—HR managers earn a median annual salary of approximately $100,000. University of Southern California ranks #1 on The 35 Best Online Master's in Human Resources Programs! USC is a leading research college that enrolls 45,000 students each year, many of whom attend classes on campus in Los Angeles. The school also offers a variety of distance learning programs throughs USC Online. Distance learners benefit from the school's high academic standards and can choose from more than 88 online programs. Administered by the school's college of professional studies, USC's master of science in human resource management (HRM) teaches students using a curriculum designed with input from HR executives. This program is ideal for professionals already working in the HR field who want to gain the knowledge and skills required to become effective leaders, such as core principles, human capital management concepts, and HR processes. 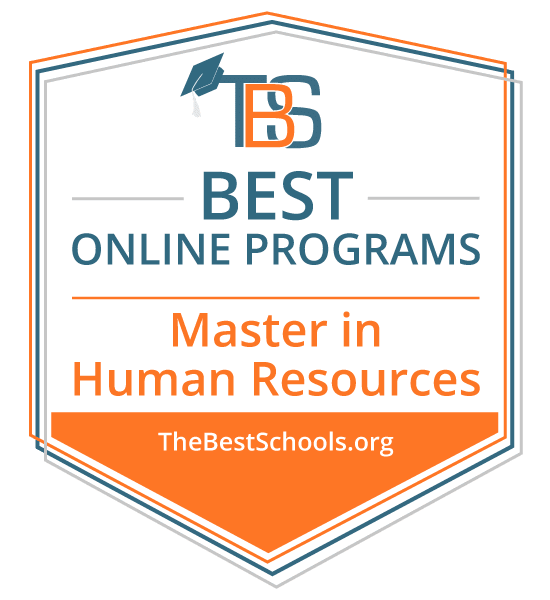 The curriculum for this master's in human resources online program examines topics such as HR strategy, organizational design, talent management, and learning and development. Students also examine practical issues faced by HR professionals, including diversity and inclusion, HR technology, managing in a global context, and the social responsibility of organizations. Students can opt for a one-year or two-year track, both of which can be completed entirely online. The program offers enrollment dates in the fall, spring, and summer terms. All distance learners pay the same tuition rate, regardless of residency. Applicants must have a bachelor's degree with a minimum GPA of 3.0 to be considered. GRE scores are not required. The University of Southern California is regionally accredited from the Western Association of Schools and Colleges (WASC). University of Illinois at Urbana-Champaign ranks #2 on The 35 Best Online Master's in Human Resources Programs! Founded in 1867, Illinois is known for innovative research and its top-ranked academics. The university's online branch -- Illinois Online -- features 75 degree, certificate, and endorsement programs, including a 32-credit master of education in human resource development (HRD), which teaches the competencies necessary to improve workplace performance and individual learning in organizations. Students can choose from one of four areas of focus. The program admits professionals already working in human resource development as well as those seeking to enter the field for the first time. In a general HRD track, students examine how they can support their organization and develop various administrative skills. The executive human resource development track prepares students to become HRD professionals who are well versed in advanced best practices. The international education and leadership track is a good fit for HRD professionals seeking to develop and implement international programs and internationalization activities for public or private companies. Finally, the management of eLearning for workplace learning and training track is designed for students pursuing careers in leadership and management, where they plan to oversee workplace eLearning programs. Each online master's in human resources track consists of eight courses, and the program is delivered fully online with both synchronous and asynchronous elements. The program admits students in the spring, summer, and fall. Applicants must have a bachelor's degree with a minimum GPA of 3.0 and submit GRE scores to be considered. The University of Illinois Urbana-Champaign is regionally accredited from the Higher Learning Commission (HLC). Pennsylvania State University - World Campus ranks #3 on The 35 Best Online Master's in Human Resources Programs! Penn State is a recognized leader in higher education, ranking among the top colleges in the world. The school enrolls almost 100,000 students each year at 24 campuses throughout Pennsylvania. Approximately 12,000 of these students earn degrees from Penn State's World Campus -- the school's virtual arm. The school offers a 33-credit master of professional studies in human resources and employee relations (HRER) program that is ideal for students seeking to become experts in theoretical and practical knowledge of human resource management. Students can earn their degree entirely online, allowing them to continue to work while studying. The program emphasizes topics such as new labor laws, employee rights, and employee benefit plans. The core of this program delves into labor and employment law, HR in multinational enterprises, ethical decision making, and human behavior and organizational performance. Students choose one of several concentrations, including benefits and compensation; labor and collective bargaining; employment and labor law; staffing, training, and development; ethics and leadership; and international HR and employment relations. The HRER program features a study abroad component, during which students from the United States, Germany, and Sweden meet in Ireland for a week-long immersive experience at Limerick University. Participants complete classes and learn about employment relations in Ireland by meeting with HR staff from several companies. Students typically complete the program in two to three years. All online students pay the same tuition rate, regardless of residency. Applicants to the HRER program must have a bachelor's degree with a minimum GPA of 3.0 to be considered. However, students do not need to submit GRE or GMAT scores. Penn State World Campus is regionally accredited from the Middle States Commission on Higher Education (MSCHE). Villanova University ranks #4 on The 35 Best Online Master's in Human Resources Programs! Founded in 1842, Villanova serves more than 10,000 students each year and provides a rigorous academic education in the liberal arts tradition. This Catholic institution offers a variety of online programs, including a master of science in human resource development. Founded 35 years ago, this program prepares HR professionals to assume leadership positions at organizations around the world. Students learn how to implement strategic initiatives, craft training programs, develop benefit packages, and use data to make effective decisions. The 36-credit curriculum includes the study of employment law, organizational development, training and development, and financial and human capital. Students also master the use of HR software in a tech-focused course and study statistical analyses, planning techniques, and evaluation strategies at for-profit organizations in a metrics and research course. All students complete a capstone experience, such as an experiential project developed in conjunction with an HR internship or work proposal. The curriculum also includes courses that can be used towards recertification from the HR Certification Institute and Society for Human Resource Management (SHRM). Villanova hosts an SHRM chapter that provides students with extracurricular and professional development activities, such as networking events, mentoring programs, and workshops. This online human resources master's degree prepares professionals to pursue careers as recruiters, benefits analysts, corporate trainers, and HR managers. Applicants must have a bachelor's degree with a minimum GPA of 3.0 to be considered. Villanova University is regionally accredited from the Middle States Commission on Higher Education (MSCHE). Georgetown University ranks #5 on The 35 Best Online Master's in Human Resources Programs! Georgetown, the nation's oldest Catholic university, offers degrees in the Jesuit tradition from its main campus in the District of Columbia. The college's professional studies school also offers a variety of online programs to distance learners throughout the world. One example is the 33-credit master of professional studies in human resources management program, which integrates theoretical learning and hands-on practice to prepare students to become HR professionals. This program is ideal for working adults and can be completed on either a full- or part-time basis. Core courses emphasize the foundations of human resources, human capital analytics, and research process and methodology. A workplace ethics class introduces students to important best practices in HR and diversity. Students go on to specialize their studies by completing coursework in one of five focus areas: strategic human capital development, foundational HR management, international HR management, human resource/organization development, and diversity and inclusion management. Graduates enter the workforce with specialized HR knowledge and the leadership skills necessary to advance their careers. The program enrolls applicants in the fall, spring, and summer, and students earn their master's in HR online in two to five years. Applicants must have a bachelor's degree to be considered, but there is no GRE or GMAT requirement. Georgetown University is regionally accredited from the Middle States Commission on Higher Education (MSCHE). University of Arkansas Global Campus ranks #6 on The 35 Best Online Master's in Human Resources Programs! Arkansas enrolls 27,000 students each year in the school's 10 colleges on its Fayetteville campus. The school boasts a catalog of more than 210 academic programs, each of which has a low student-to-faculty ratio that allows for personalized, one-on-one instruction. Arkansas also offers a variety of distance learning programs in entirely online and hybrid formats. The 33-credit master of education in human resource and workforce development education is an online program that prepares students to design, manage, and evaluate training ‎programs to improve staff productivity ‎and organizational effectiveness. The curriculum includes courses on organizational analysis, methods to facilitate learning in the workplace, technological resources, and legal and ethical issues in employment. Students also examine HR from an international perspective as they study how globalization and culture impact the workplace. There is also a culminating capstone course that focuses on research and analysis of current employment trends. Transfer students can apply up to six credits earned at another institution towards their online master's degree in human resources. Most students earn their degree in two years, but some take up to six years to complete all program requirements. The program admits students in the fall and spring terms. All online students pay the same tuition rate, regardless of residency. Applicants must have a bachelor's degree to be considered, but they do not need to submit GRE scores. The University of Arkansas is regionally accredited from the Higher Learning Commission (HLC). Washington University in St Louis ranks #7 on The 35 Best Online Master's in Human Resources Programs! WUSTL was founded in 1853 and offers a variety of programs that emphasize teaching, research, and patient care. The school boasts small class sizes with an average 8-to-1 student-to-faculty ratio, allowing each student to receive one-on-one instruction. WUSTL offers several distance learning programs, including a 36-credit master of arts in human resources management. This program develops professional competencies in key HR areas, including human relations and communications, training and development, and compensation and benefits. The 18-credit core curriculum includes courses on topics like HR metrics, finance, organizational behavior, strategy and organizational effectiveness. There is also an integrative capstone that involves an independent project completed at a partnering organization as well as a review of topical trends affecting organizations and HR. Students must also complete 18 credits in one of two areas: professional HR management or management and organizational development. Students learn how to build an effective mentoring program by recruiting, selecting, matching, training and assessing participants. Additionally, an SHRM learning system course prepares students to sit for the Professional in Human Resources or Senior Professional in Human Resources certification exams, both of which represent standard credentials held in the field. Graduates are prepared to contribute to their company's strategic planning, organizational development, and change and risk management. Transfer students may apply up to six graduate credits, earned with a minimum "B" grade, towards their online human resource master's degree. Students can enroll in classes during the fall, spring, or summer terms. Applicants must have a bachelor's degree to be considered. Washington University in St. Louis is regionally accredited from the Higher Learning Commission (HLC). Clemson University ranks #8 on The 35 Best Online Master's in Human Resources Programs! Clemson is a public school in South Carolina, located in the foothills of the Blue Ridge Mountains. The school consists of seven colleges and offers 80 different majors. Clemson offers a 36-credit master of human resource development program through its college of education. This fully online program teaches students about training and development, strategic HRD, and ways to improve both individual and organizational performance. Students also examine innovative approaches to addressing challenges in the workplace in leadership, cultural diversity, and ethics. The program is best suited for professionals who already work in business, government, or nonprofit settings. Coursework in this master's in human resources online program cover topics such as instructional systems design, human performance improvement, instructional material development, and consulting for education and industry. There is also an applied research and development course, where students learn about a chosen HRD topic related to their professional goals and personal interests. Additionally, a learning leadership course examines select topics in educational administration. Some students choose to specialize their studies in athletic leadership to advance their careers in the arena of intercollegiate athletics. The program admits students once a year in the fall. Students can earn their degree in two years by enrolling in two courses each semester. Admission requirements include a bachelor's degree earned with a minimum 3.0 GPA and competitive GRE scores. Work experience is also highly preferred. Clemson is regionally accredited from the Southern Association of Colleges and Schools Commission on Colleges (SACSCOC). University of Connecticut ranks #9 on The 35 Best Online Master's in Human Resources Programs! UConn is a top research college that was founded in 1881 in Storrs, Connecticut. The school serves over 30,000 students each year and operates several campuses, a medical school, and a teaching hospital. UConn's 14 schools and colleges also offer a variety of distance learning programs. The school offers a hybrid master of science in human resource management program, which can be earned on a part-time schedule and is ideal for working professionals. This online master's in human resources features collaborative learning experiences and a curriculum grounded in academic research. The 33-credit curriculum covers topics like managing organizations, talent management, HR metrics and talent analytics, managing risk in the workplace, and human capital and workforce capability development. Students can also complete electives on a variety of subjects, including diversity and inclusion, negotiation strategies, employee and labor relations, and total rewards and performance management. Students must also complete a capstone project, where they must conduct a systemic analysis of an HR case study. Applicants must have a bachelor's degree to be considered. However, they do not need to submit GRE or GMAT scores. The University of Connecticut is regionally accredited from the New England Association of Schools and Colleges (NEASC). University of Oklahoma - Norman ranks #10 on The 35 Best Online Master's in Human Resources Programs! Oklahoma offers 170 majors and engages in extensive academic research. The school's department of human relations offers a 36-credit master of human relations with a concentration in human resources. This hybrid degree is ideal for professionals who want to work in team-based organizations or who are passionate about social justice. The human relations curriculum focuses on three main areas: counseling, organizational studies, and social justice and change. The organizational studies course covers organizational behavior, HR development, and diversity in the workplace. Social justice and change courses teach students how to apply theory to societal problems and develop solutions and outcome-based assessments. In this program, students discuss case studies, select areas of interest to pursue, and choose either a thesis or non-thesis option. The curriculum includes courses that delve into topics like employment law, workforce staffing, benefits and compensation, employee and labor relations, and HR strategy. Those who select a non-thesis option must either pass a comprehensive exam and participate in an internship or engage in a capstone experience involving a research project and internship under faculty supervision. This program can be completed on either a full- or part-time basis. Transfer students may apply up to nine graduate credits earned at another institution towards their degree. Applicants must have a bachelor's degree to be considered. The University of Oklahoma is regionally accredited from the Higher Learning Commission (HLC). Cornell University ranks among The 35 Best Online Master's in Human Resources Programs! Situated on a 2,300-acre campus in Ithaca, New York, Cornell offers graduate students 108 fields of study, including a suite of business programs. The school's 15-month executive master of human resource management program enrolls students who hold at least eight years of business experience. Students acquire the knowledge and competencies needed to advance into senior HR roles where they can develop and implement HR strategies on a global scale. They also gain access to research related to the newest HR practices and policies. Coursework is delivered mostly online, although there are three required one-week immersions that must be completed on-campus. During these on-campus visits, students meet with faculty and peers to discuss best practices, engage in face-to-face meetings, and build their professional HR networks. The curriculum includes courses on a variety of topics, such as talent acquisition and management, negotiation and mediation skills, human resource analytics, compensation strategies, and global HR and labor relations. This online master's degree in human resources also requires students to design and implement an HR project in their organization. This project should address a specific business challenge, have an HR function with implications for the workforce, and receive support from leaders within the organization. Applicants must have a bachelor's degree to be considered, though they do not need to submit standardized test scores. Cornell University is regionally accredited from the Middle States Commission on Higher Education (MSCHE). New York University ranks among The 35 Best Online Master's in Human Resources Programs! NYU is one of the largest private colleges in the nation, enrolling over 50,000 students each year on campuses in New York City and overseas. NYU's professional studies school offers a wide variety of online programming, including a master of science in human resource management and development that teaches learners how to manage talent within global organizations. The curriculum emphasizes management principles and organizational behavior, decision making based on data-driven metrics, and business strategy and ethics. Core coursework covers subjects such as financial management, information technology, foundations of HR management, and managing in a global economy. A course on quantitative methods and metrics examines how to use management science in decision making. There is also a business writing and presentations course that teaches students how to effectively communicate their ideas in writing and give dynamic oral presentations. Students must choose one of the following concentrations: HR management; global talent management; organizational effectiveness; or learning, development, and executive coaching. They must also complete a capstone project as either a thesis or a business simulation. This program can be completed entirely online or in a hybrid format. Full-time students can earn their degree in two years, while part-timers typically need five years to graduate. All applicants must have a bachelor's degree to be considered, and some students may also need to submit GRE or GMAT scores. New York University is regionally accredited from the Middle States Commission on Higher Education (MSCHE). Boston University ranks among The 35 Best Online Master's in Human Resources Programs! BU offers 250 different fields of study and is one of Boston's largest employers. BU's programs are delivered through 17 schools and colleges. The school offers a 48-credit master of science in human resources management that is ideal for professionals seeking to advance their careers in human resources. This program emphasizes how HR professionals can use technology and optimize human assets to manage change, maximize productivity, and maintain a competitive edge. The curriculum for this master's in human resources online program consists of seven core courses that examine topics such as finance; e-commerce; project management; international business, economics, and cultures; quantitative and qualitative decision making; and planning and operating new ventures. Students can also enroll in electives in areas such as enterprise risk management; developing new products and services; or how to manage employees, professionals, and teams. In the enterprise risk planning and compliance course, students examine corporate and organizational security with an emphasis on disaster and emergency preparedness. There is also a research and analysis course where students engage in market and economic research as they explore the factors necessary for effective tourism and regional development planning. Students who already hold Certified Employee Benefit Specialist (CEBS) certification only need to complete eight courses, totaling 32 credits. Admission requirements include a bachelor's degree and five years of professional experience or CEBS certification. All applicants must also successfully complete the online ALEKS math tutorial to demonstrate mathematical proficiency. Boston University is regionally accredited from the New England Association of Schools and Colleges (NEASC). Quinnipiac University ranks among The 35 Best Online Master's in Human Resources Programs! Quinnipiac is a private college in Connecticut that enrolls more than 10,000 students each year on its three campuses. The school's education model blends theoretical and experiential learning to produce qualified professionals across several disciplines. Quinnipiac Online hosts a variety of graduate programs for students seeking to advance in their careers and pursue leadership roles. The school offers a 33-credit master of science in organizational leadership with a human resource track. This program examines the factors that contribute to effective leadership and organizational success, including social and emotional intelligence, strategic thinking, and data-driven performance improvement. In the 24-credit core, students enroll in classes on organizational leadership, performance management, ethics and governance, and leading organizational change. This program's HR track features three field-specific courses. In a leadership in HR course, students examine human resource management principles, including recruiting, compensation and benefits, and performance management. There is also a course on employment law for non-lawyers that covers legal issues in HRM as well as the laws that govern workplace personnel. Finally, there is a course covering employment development strategies that teaches students how to develop human talent. Students must also complete a capstone courses that involves designing and implementing a consulting plan where they must analyze organizational challenges, make recommendations, and highlight implementation strategies. Admission requirements include a bachelor's degree and at least four years of relevant full-time work experience. Quinnipiac University is regionally accredited from the New England Association of Schools and Colleges (NEASC). University of Denver ranks among The 35 Best Online Master's in Human Resources Programs! Founded in 1864 as a seminary, DU is a mid-sized college located near the Rocky Mountains. DU's education model emphasizes “learning by doing” with collaboration between students and faculty across disciplines. The school promotes individualized learning with small classroom sizes that boast an average 11-to-1 student-to-faculty ratio. DU offers several advanced degrees that focus on HR management, including a 48-credit master's in HR employee relations, a 48-credit master's in HR operations, and a 48-credit master's in HR management and development. These degrees feature the same 20-credit core, in which students enroll in classes covering finance for HR professionals, principles and practice of HR, research practices and applications, and HR across organizations. In the human relations concentration, students cover topics such as employee compensation, employment law, and employment total benefits. The HR operations concentration explores HR technology solutions, HR analytics and research, value and impact of HR interventions, and HR competencies and talent management. Finally, the management and development concentration examines consulting and HR applications; change management; organizational life cycles and HR implications; and organizational leadership, team effectiveness, and communications. Students in these online HR master's programs engage in a capstone seminar or project where they solve a challenge within their area of specialization. Faculty deliver all programs fully online in 10-week terms. Students may transfer up to 12 graduate credits into the program. All online students pay the same tuition rate, regardless of residency. Applicants must have a bachelor's degree with a minimum GPA of 2.5 to be considered, but they do not need to submit GRE or GMAT scores. The University of Denver is regionally accredited from the Higher Learning Commission (HLC). Florida International University ranks among The 35 Best Online Master's in Human Resources Programs! FIU is one of the largest colleges in the nation with an enrollment of over 54,000 students each year. The Miami-based institution offers 190 degree programs in a variety of fields, from the humanities to STEM. FIU's catalog of business degrees includes a 38-credit master of science in human resource management, which is delivered entirely online and is ideal for working HR professionals. This one-year curriculum prepares graduates to assume leadership roles in a diverse and international workplace. Graduates enter the workforce proficient in strategic staffing, shaping corporate culture, and fostering organizational change. The curriculum includes the study of critical thinking in HRM, employment law, and HRM metrics. An international HRM course examines how companies can recruit, train, and manage employees from other countries; specific topics include cross-cultural differences and ways to manage international assignments. There is also a course on talent management examines how to effectively implement performance management systems, covering electronic performance monitoring, methods to diagnose performance challenges, and implementing solutions. Students also attend a series of mandatory seminars on topics like finance for HR professionals and professional development. The school also offers an optional residency, allowing students to interact with peers and faculty as well as to network with industry professionals on campus. Applicants to the online HR master's programs must have a bachelor's degree earned with a minimum GPA of 3.0 to be considered. Some students may also need to submit their GRE or GMAT scores. Florida International University is regionally accredited from the Southern Association of Colleges and Schools Commission on Colleges (SACSCOC). Robert Morris University ranks among The 35 Best Online Master's in Human Resources Programs! Founded as a school of accountancy in 1921, Robert Morris now oversees a catalog of 80 programs that emphasize career preparation. The school offers several business degrees for distance learners through RMU Online, including a master of science in human resource management. This online degree provides students with a strong theoretical foundation in HR while also emphasizing practical applications in the workplace. The program aligns with SHRM standards and provides students with advanced proficiency in various HRM areas, including employee retention, benefits administration, retirement planning, and strategic human resource management. A training and development course examines career development for employees and succession planning for organizations; students engage in project-oriented case analysis and discuss organizational challenges in performance management. Another course focuses on how to use employee compensation to attract and keep talented employees in a competitive labor market. Students who graduate from this master's in human resource management online program are competent in the use of data science to analyze an organization's data to develop and implement effective human resource strategies. Admission requirements include a bachelor's degree with a minimum GPA of 3.0 and GRE, MAT, or GMAT scores. Robert Morris University is accredited from the Middle States Commission on Higher Education (MSCHE). University of North Texas ranks among The 35 Best Online Master's in Human Resources Programs! With a main campus in Denton, UNT offers a comprehensive catalog of degrees administered by 12 colleges and schools. UNT provides nontraditional learners with a suite of business degrees that can be earned in an accelerated time frame. UNT's college of business offers a 36-credit master of business administration with a focus on organizational behavior and human resource management. Students receive an advanced business education while also learning how to optimize human resource management to enhance a company's competitive advantage. The MBA core covers topics like financial management, marketing management, and organizational behavior and strategy. The organizational behavior and HRM concentration emphasizes coursework on subjects such as labor relations, leadership research and development, and compensation and motivation theory. A course on managing organizational change examines the theories and tools organizations use to adapt in a dynamic business environment. There is also an MBA course in administrative strategy, taken in the final semester as a capstone experience. In this course, students apply the skills learned throughout the program to address strategic organizational problems. Courses are delivered asynchronously online in eight-week sessions, and the school features five start dates throughout the year. Students can earn their degree entirely online in as few as 14 months. Admission requirements includes a bachelor's degree earned with a minimum GPA of 3.0 and GMAT scores. The University of North Texas is regionally accredited from the Southern Association of Colleges and Schools Commission on Colleges (SACSCOC). American University ranks among The 35 Best Online Master's in Human Resources Programs! American University provides students with an education that blends theoretical and experiential learning. Located in the the nation's capital, the university enrolls students in 160 degree programs administered by eight schools. The majority of AU's undergraduate and graduate students engage in internships at organizations and companies in the D.C. metro area. Those seeking to develop HR competencies can enroll in the school's 30-credit master of science in human resources analytics and management. This program is delivered entirely online and teaches students how to develop robust HR programs, design engaging online initiatives, and enhance the development of HR plans. This master's in human resources online program focuses on HR analytics and management with coursework that covers human resource information systems; compliance and risk management; and methods to evaluate hiring, performance, and employee metrics. There are also three core courses that delve into data-driven decision making, intercultural communications, and the use of new technologies to innovate. A suite of electives allows students to pursue their career interests by enrolling in classes on topics like adaptive project management, project cost-benefit analysis, and strategic management of sports organizations, among others. Finally, there is a required capstone project where students demonstrate proficiencies in planning, document preparation, and research and analysis. Students can earn their degree in as few as 20 months. Applicants must have a bachelor's degree and submit a resume to be considered. American University is regionally accredited from the Middle States Commission on Higher Education (MSCHE). University of Scranton ranks among The 35 Best Online Master's in Human Resources Programs! Scranton provides students with a liberal arts curriculum in the Jesuit tradition. Students can earn some of Scranton's 29 graduate degrees online, including a 39-credit master of science in human resources, which emphasizes fairness and equity in the workplace. Students receive a strong theoretical foundation in the processes used to promote employee performance and job satisfaction, as well as their application in the workplace. In the first semester, faculty require students to complete two prerequisite courses in human resources and organizational behavior and leadership. The online curriculum builds on this knowledge by covering topics like strategic planning, recruitment and staffing, total rewards, employee and labor relations, and workplace diversity. A course on risk management explores occupational safety and health legislation as well as the policies management put into place to provide a safe work environment. Students can also enroll in a capstone course where they apply HR concepts to an area related to their career interests. This online master's in human resources program prepares students for certification from various organizations, such as SHRM certification. Students can participate in an array of extracurricular activities, including membership in Scranton's SHRM chapter. Applicants must have a bachelor's degree with a minimum GPA of 2.75 to be considered. The University of Scranton is regionally accredited from the Middle States Commission on Higher Education (MSCHE). Louisiana State University ranks among The 35 Best Online Master's in Human Resources Programs! LSU is the state's most comprehensive institution of higher education, serving as a hub of academics, research, and cultural enrichment. Located in Baton Rouge, LSU offers an academic catalog of 194 degrees and provides a variety of eLearning options through LSU Online. The online college offers several master's degrees, including a master of science in human resource education with a concentration in human resource and leadership development. This 36-credit program prepares HR professionals to harness an organization's human capital, identify and address performance challenges, and use evidence-based practice to drive change initiatives. The curriculum's core examines the foundations of HR development, implementation of adult education, advanced organizational psychology, and methods to design and evaluate training and development programs. Students may also purse particular areas of interest by enrolling in elective coursework that covers topics such as training in global organizations, workplace planning and analysis, and instructional design in HR development. Students can complete this master's in human resource management online program in as few as 12 months. Applicants must have a bachelor's degree earned with a minimum GPA of 3.0 to be considered. Louisiana State University is regionally accredited from the Southern Association of Colleges and Schools Commission on Colleges (SACSCOC). Central Michigan University ranks among The 35 Best Online Master's in Human Resources Programs! Since its foundation as a teachers' college, CMU has grown into a nationally ranked school with an enrollment of over 27,000 students. The university operates from a main campus in Mount Pleasant and several satellite locations throughout North America. Thousands of CMU students enroll in classes online or in a hybrid format. CMU Online offers a comprehensive list of programs, including multiple business degrees. The school offers a 36-credit master of business administration in HR management that provides distance learners with advanced business knowledge in areas like accounting, finance, and marketing. The core curriculum examines topics such as data analysis for managers, the global economic environment, marketing-based management, managerial accounting, and management information systems. A course on managing and leading individuals emphasizes the frameworks used to understand individual and group behavior as well as the processes used to foster organizational change. There is also a course on strategic management, where students develop competitive business strategies by analyzing a business environment, implementing strategies, and evaluating outcomes. Students enroll in three courses in the HR specialization: HR management, employee selection and evaluation, and organizational development. The program features three enrollment periods in the fall, spring, and summer terms. All distance learners pay the same tuition rate, regardless of residency. Admission requirements include a bachelor's degree earned with a minimum GPA of 2.7, prerequisite business courses, and GMAT scores. Central Michigan University is regionally accredited from the Higher Learning Commission (HLC). The MBA in HR management program is fully accredited by the Association to Advance Collegiate Schools of Business (AACSB). Western Carolina University ranks among The 35 Best Online Master's in Human Resources Programs! Situated in the Appalachian mountains, WCU offers several academic programs from its main campus in Cullowhee, North Carolina. Through the College of Education and Allied Professions, WCU offers a 36-credit-hour Master of Science in Human Resources program that is ideal for busy professionals seeking to develop advanced competencies in the HR field. This online program immerses students in the study of evidence-based practices, covering HR in a global environment and different ways to effectively consult with organizations and can be completed in as little as two years, while maintaining full-time employment. The curriculum aligns with competencies identified by organizations such as the Academy for Human Resource Development and SHRM. It also covers topics that include principles and practices in human resources, organization acumen for HR leaders, and HR consulting. During the advanced HR consulting course, students work as an HR consultant for a small business, nonprofit, or local government agency where they work on a project, such as a mentoring program or an employee handbook. Students also choose from a suite of electives to specialize their studies on topics like coaching for performance and legal issues in human resources. There is also a capstone course that immerses students in the study of HR and organizational strategy, HR challenges and their impacts, and the role of strategic HR planning in organizational success. Admission requirements include having earned an undergraduate or graduate degree from an accredited university, maintained a minimum GPA of 3.0, completed GRE exam, official transcripts, and three letters of recommendation from individuals able to vouch for scholarly abilities and good work habits. Western Carolina University is regionally accredited from the Southern Association of Colleges and Schools Commission on Colleges (SACSCOC). Saint Joseph's University ranks among The 35 Best Online Master's in Human Resources Programs! For 160 years, Saint Joseph's has provided students with a rigorous liberal arts education based on Jesuit values. The Philadelphia-based college offers advanced degrees designed to provide nontraditional learners with professional credentials. The university's business school offers a 33-credit master of science in strategic human resource management program, which teaches professionals skills in areas related to finance, operations, and HR. The curriculum aligns with SHRM guidelines and explores subjects such as ethical practices in business, talent selection and retention, total rewards, HR fundamentals, and finance and accounting for managers. There are also courses that explore the application of HR technology solutions in a variety of settings, including talent acquisition, performance management, and eLearning. During their final semester, students must complete a capstone experience where they choose a particular area of interest and develop a strategic HRM project. Students can enroll in the master's in human resources online program on either a full- or part-time basis. Applicants must have a bachelor's degree and submit GMAT, GRE, or MAT scores to be considered. Saint Joseph's University is regionally accredited from the Middle States Commission on Higher Education (MSCHE). The MS in strategic human resource management program is fully accredited by the Association to Advance Collegiate Schools of Business (AACSB). University of Louisville ranks among The 35 Best Online Master's in Human Resources Programs! Louisville consists of 12 colleges and schools on three campuses located throughout Kentucky. The school offers 200 degree programs, some of which can be earned entirely online. Louisville offers a 36-credit master of science in human resources and organization development that emphasizes five central goals for HR professionals: investigate gaps, produce interventions, implement and lead change, evaluate outcomes, and integrate foundational knowledge and skills. This online master's in human resources program offers concentrations in health professions education, human resource leadership, and workplace learning and performance. All three tracks share some common courses on evidence-based research, organizational analysis, performance improvement, and program and organization evaluation. The health professions concentration includes instruction and research-based projects in areas such as clinical education, professional development, and performance improvement. The HR leadership concentration immerses students in the study of human capital, human resource management, and organization development, emphasizing hands-on projects. Finally, the workplace learning and performance specialization teaches students the concepts and design projects related to human resource development, training and development, and instructional design and technology. All three plans of study align with SHRM guidelines for HR graduate programs. Students can complete the program entirely online, although those in the hybrid health professions education concentration must complete some on-campus components. The program admits applicants in the fall, spring, and summer terms. All applicants must have a bachelor's degree earned with a minimum GPA of 3.0 to be considered. Some students may also be asked to submit GRE scores. The University of Louisville is regionally accredited from the Southern Association of Colleges and Schools Commission on Colleges (SACSCOC). University of West Florida ranks among The 35 Best Online Master's in Human Resources Programs! Based in Pensacola, UWF consists of five academic colleges and serves a student body of over 13,000 students each year. About one-third of UWF's students enroll in classes entirely online, where they have access to 50 distance learning degrees and certificate programs. The school offers a master of business administration program that features several specializations, including an emphasis in human resource management. This 36-credit program trains professionals to better link organizational strategy and HR management. The MBA core examines business topics such as financial management, strategic management, business process integration, management and organizational behavior, and advanced managerial economics. The HR emphasis covers a wide variety of subjects, including a compensation and benefits course, where students examine how compensation systems support the organization's strategic goals. The curriculum includes a recruitment and selection course that delves into trends, best practices, and legalities involved in the effective recruitment of human capital. Students must also enroll in a performance management course where they examine how HR managers help employees maintain high performance once hired. Admission requirements include a bachelor's degree earned with a minimum GPA of 3.0 and GRE or GMAT scores. The school offers an out-of-state tuition waiver that can reduce tuition for those residing outside of Florida. The University of West Florida is regionally accredited from the Southern Association of Colleges and Schools Commission on Colleges (SACSCOC). The MBA in human resource management program is fully accredited by the Association to Advance Collegiate Schools of Business (AACSB). Colorado State University - Global Campus ranks among The 35 Best Online Master's in Human Resources Programs! CSU offers a wide variety of online learning opportunities for nontraditional students. The virtual college hosts career-focused degree programs that align with industrial needs. CSU offers a master of human resource management program that is ideal for those interested in pursuing leadership roles in human resources. Graduates enter the workforce with comprehensive knowledge about theories and best practices that managers use to maximize an organization's human capital. The curriculum aligns with standards set forth by SHRM and includes coursework that covers effective organizations, managing HR, strategic labor relations, and staffing and talent development. Those pursuing this online human resources master's degree can choose from several specializations in areas such as business intelligence, fraud management, healthcare management, criminal justice leadership, and information management. There is also a required capstone project that involves incorporating principles in areas such as effective labor management, legal HR challenges, and leading diverse teams. Students must also complete an eight-week internship where they work at an organization under the supervision of a senior-level professional. Students benefit from CSU's partnership with SHRM; participants pay reduced membership fees and certification discounts for the SHRM-Senior Certified Professional or SHRM-Certified Professional certification exams. They also gain access to library services, online university tutoring, career counseling, and tech support. All distance learners pay the same tuition rate, regardless of residency. Colorado State University-Global Campus is regionally accredited from the Higher Learning Commission (HLC). University of Texas at Tyler ranks among The 35 Best Online Master's in Human Resources Programs! UT Tyler is part of the 14-college University of Texas System that administers programs through seven colleges on a 259-acre campus. The school enrolls over 10,000 students each year in 80 degree programs and offers a suite of eLearning options. UT Tyler's business college offers its master of science in human resource development exclusively online, featuring a curriculum that incorporates coursework, research, and projects with no thesis requirement. The curriculum emphasizes three main areas of study: foundations of HRD, theoretical and practical methods used to teach adult learners, and different perspectives on organization development. Specific topics covered include conflict resolution, performance consulting, organizational development, and total quality management. One notable course looks at how to effectively measure, evaluate, and assess learning in formal business training programs. Students supplement the core curriculum with graduate electives related to their career interests. They also work with faculty to design research-based projects. The coursework and research components of this master's in human resource management online program prepare students to pursue doctoral study or enter the workforce directly. Admission requirements include a bachelor's degree earned with a minimum GPA Of 3.0 and GMAT scores. UT Tyler is regionally accredited from the Southern Association of Colleges and Schools Commission on Colleges (SACSCOC). Utah State University ranks among The 35 Best Online Master's in Human Resources Programs! Nestled in the state's northern mountains, Utah State operates a main campus in Logan, three regional campuses, and extension sites across the state. Additionally, the school's virtual college enrolls more than 14,000 students each year. Utah State's business school administers several programs, including its 36-credit master of human resources degree that features an executive format for distance learners. The MHR program is designed for working professionals and can be completed in one to two years. Students learn how to attract top talent and optimize an organization's human capital through strategic HR leadership. The curriculum covers topics such as training and organizational development, talent acquisition and retention, human resource strategy, negotiations for executives, and employee relations and the labor movement. Faculty use business projects to develop a student's competencies in practical settings. The program boasts a 95% job placement rate, and recruiters from local, national, and international organizations provide summer internship opportunities and employment prospects. The program accepts applicants in January, May, and August. To enroll in this master's in human resources online program, students should demonstrate competency in four areas: accounting, Microsoft Excel, finance, and marketing. Students without prior experience in these areas can take a business prep course online. Applicants must have a bachelor's degree and submit GRE, GMAT or MAT scores to be considered. Utah State University is regionally accredited from the Northwest Commission on Colleges and Universities (NWCCU). The master of human resources program is fully accredited by the Association to Advance Collegiate Schools of Business (AACSB). Texas A&M University–Commerce ranks among The 35 Best Online Master's in Human Resources Programs! TAMUC is the second largest institution in the state's 14-college system. The school oversees a main campus in Commerce and additional locations in cities such as Dallas and Corsicana. The university also has a strong online presence, offering many of its 144 degrees as distance learning programs. TAMUC's graduate business program has featured online classes since 1995 and includes a master of science in management with a concentration in human resources management. This degree provides students with a foundation in management and leadership, whether they have a business background or not. Students complete 30-39 credits, depending on their previous coursework completed at the baccalaureate level. The program includes three foundational courses in operations and organizations, marketing environment, and finance for decision makers. However, faculty may waive these courses for students with business degrees. All must enroll in management courses, including financial management, quality management, and management and organizational behavior. Students hone their research expertise by completing an applied business research course where they learn to define research problems and collect, analyze, and interpret data. HRM-related courses cover topics like executive development, transforming organizations, and current issues in human resource management. Admission requirements include a bachelor's degree and GRE or GMAT scores. Texas A&M University–Commerce is regionally accredited from the Southern Association of Colleges and Schools Commission on Colleges (SACSCOC). The master of science in management program is fully accredited by the Association to Advance Collegiate Schools of Business (AACSB). University of Houston, Clear Lake ranks among The 35 Best Online Master's in Human Resources Programs! UHCL's main campus is located within a wildlife preserve about 30 minutes outside downtown Houston. The school's academic catalog contains 80 degrees and is administered through four colleges. UHCL's virtual college allows students to earn a number of undergraduate or graduate degrees entirely online. The school's business college offers a 36-credit master of arts in human resource management for both working professionals and full-time students. This asynchronous program educates students in five key areas: general business management, change management, strategic decision making, core human resource processes, and personal mastery and influence. This master's in human resource management online program covers topics like a survey of business principles, international accounting, labor relations, management science and operations, and motivational design of instruction. Students also delve further into HR-specific topics by studying HR management processes; HR information systems; compensation and benefits; metrics and performance; training and development; and employee planning, staffing, and selection. They can also apply their newfound skills during an optional internship at a public or private organization. This program is available entirely online, and full-time participants can earn their degree in as few as 16 months. The program aligns with standards set by SHRM. Admission requirements include a bachelor's degree earned with a minimum GPA of 3.0 and the submission of GRE or GMAT scores. The University of Houston-Clear Lake is regionally accredited from the Southern Association of Colleges and Schools Commission on Colleges (SACSCOC). The master of arts in human resource management program is fully accredited by the Association to Advance Collegiate Schools of Business (AACSB). University of South Dakota ranks among The 35 Best Online Master's in Human Resources Programs! USD is South Dakota's flagship school, offering top-ranked academic programs on a 274-acre campus in the city of Vermillion. The university delivers 280 academic programs in classrooms with a 17-to-1 student-to-faculty ratio. Additionally, USD Online hosts 40 programs, providing graduate students the flexibility to earn degrees asynchronously in fields such as education, healthcare, and business. The school's college of arts and sciences offers a 36-credit master of science in administration with a specialization in human resources. This cross-disciplinary program prepares students to become administrators who can assume roles in public service organizations such as nonprofits, social service organizations, and governmental agencies. The curriculum features core coursework in budgetary and fiscal management, administrative law and government, administrative thought and ethics, professional writing for administrators, and research in administrative practice. The college also offers a variety of HR electives, allowing students to complete 12 credits of coursework on topics like public personnel management, HR training and development, team building and group decision making, and career development for HR professionals. USD Online's resources include tutoring from the school's writing center and tech support. All distance learners pay the same tuition rate, regardless of residency. Applicants must have a bachelor's degree to be considered. Pittsburg State University ranks among The 35 Best Online Master's in Human Resources Programs! Pitt State is a public university that was founded in 1903 in Pittsburg, Kansas. The school boasts small class sizes with an average student-to-faculty ratio of 17-to-1. Pitt State also offers a full complement of distance learning programs, including a master of science in human resource development that is a good fit for working professionals who have undergraduate degrees in human resources, business, education, or a similar field. The program emphasizes management and consulting and is ideal for students with backgrounds in employee training, education and development, performance improvement, and/or organizational development. Students pursuing their master's in HR online complete 34-37 credits of coursework, including core courses that cover topics like workforce development, organizational development, and planning and implementing HRD programs. The curriculum emphasizes four main HRD topics: personal development, professional presentations, designing HRD interventions, and leadership techniques. At the end of the program, students have the option of completing an internship, research coursework, or thesis. The program is delivered on a part-time basis, allowing students to complete six courses each semester and graduate in two years. All coursework can be completed entirely online. All online students pay the same tuition rate, regardless of residency. Admission requirements include a bachelor's degree and completion of a prerequisite introduction to HRD course. Pittsburg State University is regionally accredited from the Higher Learning Commission (HLC). Emmanuel College ranks among The 35 Best Online Master's in Human Resources Programs! Emmanuel was founded in 1919 in Boston as the first Catholic institution for women in New England. The school is now open to both men and women a boasts a comprehensive catalog of degrees in the liberal arts and sciences. Emmanuel emphasizes experiential learning and encourages students to conduct research with faculty and undertake internships. The school offer a variety of distance learning graduate degrees in both hybrid and fully online formats. The school's 36-credit master of science in human resource management is a good fit for early- and mid-level professionals and emphasizes topics such as labor relations and employment law, talent management and acquisition, and total rewards. Specific topics covered in the master's in HR online track include leadership and organizational behavior, organizational development, negotiation and conflict management, ethics and diversity, and strategic planning and management. Students must complete a capstone experience, where they apply skills learned throughout the program on a project that benefits their current employer. Courses are offered in seven-week sessions and part-time students can earn their degree in two years. Distance learners at Emmanuel have access to online resources including enrollment counseling, tutoring, and careers services. All online students pay the same tuition rate, regardless of residency. Applicants must have a bachelor's degree earned with a minimum GPA of 2.5 to be considered. Emmanuel College is regionally accredited from the New England Association of Schools and Colleges (NEASC). Belhaven University ranks among The 35 Best Online Master's in Human Resources Programs! Belhaven is a Christian liberal arts school that offers programs that blend academic rigor and biblical principles. The school operates a main campus in Jackson, Mississippi, as well as at other locations across the South. Belhaven boasts small class sizes with an average student-to-faculty ratio of 12-to-1, allowing all students to receive one-on-one instruction. The school offers more than 30 distance learning programs, including a 42-credit master of business administration with a concentration in human resources. This MBA provides students with advanced training in business and management while also emphasizing Christian values. The curriculum examines topics such as organizational behavior, business principles, managerial economics, marketing management, and strategic planning. The nine-credit human resources concentration also covers topics like employee relations, compensation and benefits, and issues and innovations in HR. The curriculum aligns with guidelines set by SHRM. Classes are delivered in eight-week terms. Students can transfer up to six graduate credits earned at another institution with a minimum “B” grade into the program. All online students pay the same tuition rate, regardless of residency. Additionally, active duty and reserve military personnel pay a reduced rate. Admission requirements include a bachelor's degree earned with a minimum GPA of 2.8 and the completion of a college algebra (or higher) math course. Belhaven University is fully accredited from the Southern Association of Colleges and Schools Commission on Colleges (SACSCOC). Despite the similarities in degree title, online HR master's programs vary from school to school. Whether through core courses, concentrations, electives, or certifications available, each online HR master's degree offers something unique to students. In the typical master's in human resource management online degree, students learn how to manage, support, and develop employees in a modern business environment. Courses focused on people management teach future professionals how to understand and assess employee performance and how to create training programs to achieve better results. Other courses teach students how to use data and technology to better inform business decisions and manage business finances. For those seeking positions in labor relations, salary negotiations, or business mediations and training, the core courses in an online human resources master's degree enable students to better understand the inner workings of a business. In addition to core courses, many master's in HR online programs offer specialities or concentrations that allow students to fine-tune their education. While many of the concentrations available to students in an online master's degree in human resources focus on various business environments -- such as finance, accounting, and/or international business -- some programs offer concentrations in specific subjects. These specialized concentrations allow HR students to study collective bargaining, employee benefits, or labor law. While some programs do not offer ready-made concentrations, students can pursue alternative paths, such as completing a thesis project. Employment law: Employment law covers everything from the legality of business practices and employee regulations to basic human rights. Expertise in employment law provides flexibility for professionals to move into many different business environments. Human behavior: Learning about human behavior allows HR professionals to better understand employees, assess their strengths and weaknesses, and build programs to help develop their skills. HR professionals with this credential pursue careers in training and development, conflict resolution, and business negotiations. Business tools: Business tool courses cover a wide range of technologies used in business. Students typically learn how to use data to assess employees, business performance, and business finances. Professionals with an understanding of business technologies manage and consult at various levels and within different business sectors. SHRM-CP: Administered by the Society for Human Resource Management, the SHRM-CP certification assures employers that the certified professional understands how to apply their training to real situations. Interested parties with a master's in human resource management online can take the four-hour SHRM-CP exam if they currently work in an HR position. Professional in Human Resources (PHR): Administered by the HR Certificate Institute (HRCI), the PHR certification affirms that the professional demonstrates a mastery over the current laws and regulations in the field -- as well as the operational features of the profession. Interested professionals with a master's in human resources online take the three-hour exam on the condition that they possess at least one year of HR professional experience. Earning an online master's in human resources prepares students to understand both the financial and the legal inner workings of a business, not to mention the people (the employees, clients, and customers) involved in the business practices. This insight allows HR professionals to occupy several different stations within an organization, including administration, finance, training and development, and management. Human Resource Specialists: Human resource specialists typically oversee employee relations, focusing on recruitment, interviewing, and hiring. On the back end, HR specialists engage in training, compensation, and conflict resolution. In addition to earning higher pay, professionals with a master's in human resource management online typically enjoy increased access to management positions. Human Resource Managers: Human resource managers work in employee relations. They strategize how to best use business finances as it relates to employee benefits, compensation, and insurance. HR managers also design and implement company-wide training programs. While some manager positions require advanced degrees, boasting an online human resources master's degree provides professionals with even better advancement opportunities. Advanced degree holders also enjoy access to federal and state positions in HR. Training and Development Managers: Training and development managers design, implement, and assess training programs. Training managers also oversee employee performance and create specialized programs that help the company overcome any issues or deficiencies. When choosing an online master's degree in human resources, look for your school's accreditation status. Regional accrediting bodies tend to oversee large public or nonprofit degree granting institutions, while national accrediting bodies typically review specialized, vocational, and for-profit programs. Of the two types, regional accreditation is generally considered more valuable. The U.S. Department of Education and the Council for Higher Education Accreditation oversee regional accrediting bodies. Though online HR master's programs aren't accredited nationally, many national HR organizations recognize programs throughout the country. Both the Society for Human Resource Management and the Human Resources Certification Institute offer various industry certifications to professionals -- which typically require the applicant to have a bachelor's degree in human resources. Therefore, when considering an online HR master's degree, students should verify that these two organizations recognize the program. Professional organizations in human resources provide powerful tools to working professionals and recent graduates looking to break into the industry. From granting access to conferences and networking events to offering professional development opportunities, professional organizations give members access to valuable supportive resources. These organizations often offer scholarship opportunities, career search assistance, and mentors to help make the transition from school to work as easy as possible. Society for Human Resource Management (SHRM): As the world's largest professional HR society, SHRM aims to embetter the individual careers of its members and the HR profession as a whole. SHRM provides members with training opportunities, such as workshops and eLearning courses, as well as access to industry events. National Human Resources Association (NHRA): The NHRA offers a wealth of training opportunities, access to networking programs, and career support at every level. Human Resources Professionals Association (HRPA): The HRPA advocates for its members and the entire HR profession. Seeking to advance the careers of its members and to ensure that HR practices meet ethical and standardized guidelines, the HRPA provides valuable industry resources to members and businesses.